The Bingo Bango Boom slot machine is bingo meets online casino to create a fun and exciting game that offers lots of chances to win. As a classic-style video slot, this one offers up just 3 reels and 1 payline, giving individuals the chance to bet only one coin on the payline. There are no wild symbols and no scatter symbols, so this one is a little different from the traditional Microgaming offerings. Many people are drawn to the fact that this game is unique and that's why it has become so popular. Although there are no bells and whistles or free spins with this particular slot, there are some great bonus features that aren't offered in most video slot machines. For instance, the first random feature offers up a random number of nudges to players. This gives the player the ability to shift a reel down one position. 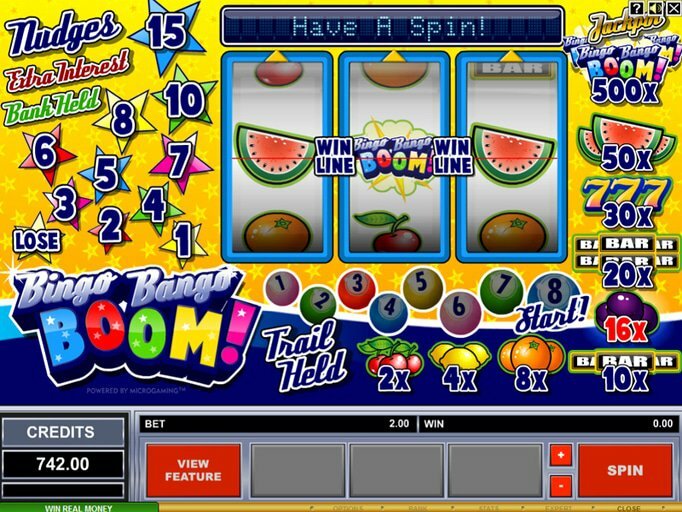 Bingo Bango Boom also lets players bank nudges so they can roll them over to the next spin and more. Another great bonus allows players to hold a reel of their choice while spinning the others, giving them a better chance of winning big. Finally, individuals are given a great bonus game if the numbers on the reel add up to more than 7. They will receive an option of bonus games and will then have the opportunity to pull in some great winnings. The symbols on the reels are beautiful, as are most graphic offerings of Microgaming. There are cherries, lemons, oranges, watermelons and other fruits as well as numbers on these reels. It's a real throwback to classic slot machines that younger and older gamblers alike will appreciate. Those who want to check out this unique game can do so right now at the Go Wild Casino. This is a great opportunity to see whether this is the right slot machine for you or not. Those who enjoy this casino can take advantage of the deposit match of 100% up to $200. Who doesn't like free cash? This will really allow you to build your bankroll and check out some of the newer titles that you haven't had the opportunity to try yet. Overall, Bingo Bango Boom is a great classic-style, simple game that many people enjoy.